Hello, ROS Parents! By virtue of being a parent with a least one child enrolled at The Red Oaks School, you are a member of the esteemed ROS Parents' Association! Membership costs nothing, and our school community thrives as a result of your time, energy, and thoughtfulness. Our mission is to foster community among the ROS families by providing social opportunities for students, parents, and families. Through the collective efforts of our fabulous parent volunteers, we organize and execute a number of events throughout the school year. Volunteering to plan, organize, and run a Parents’ Association event gives you the opportunity to connect with other parents in our vibrant Red Oaks community. It also provides access to the school community in a way that connects you with your children and their dynamic education. As parents, we are pulled in many directions and often feel like we have little time “left over.” When we all pitch in to make Parents’ Association events successful, our participation is not a burden on our time but rather a boon to our spirits! Please take a moment to familiarize yourself with the opportunities for involvement, note the dates on your calendar, and let us know how you would like to pitch in. You can complete this online form or shoot us a quick email at pa@redoaksschool.org, which is a great way to communicate with us through the school year. Your involvement plays a huge role in the success of each school year. Your gifts of time and energy are priceless. A very casual gathering of new families with several “old” families just before school resumes. Held in the school playground at Cutler, students and parents enjoy a little ice cream and friendship from 2 to 3 P.M.
We’ll need a bunch of parent volunteers to help facilitate picture day by combing hair, straightening ties, gathering students by classroom, etc. A fun-filled day at the Cutler Street Campus for the entire Red Oaks family, alumni, friends, neighbors, faculty and administration to celebrate the fall season. Highlights include a bluegrass band, crafts, games, food, and socializing! This event offers a variety of volunteer opportunities from set-up to clean-up. An annual pick-up game of soccer on a fall afternoon when parents and kids team up to play soccer! Last year's parent social was held at Seasons, an olive oil and vinegar taproom on South Street in the heart of Morristown. The committee can explore alternate locations if desired. Mingle with parents and enjoy some wine, light hors d'oeuvres, and some kid-free time together! Held at the nearby Mennen Ice Arena, the ice skating party marks the beginning of winter break for Lower and Upper Elementary students and the Middle School students. Families are also encouraged to join in the skating time. Pizza, hot chocolate, and light snacks are provided for all who attend. Our early childhood classroom students put the Montessori principles of grace and courtesy into action through a themed tea party. Students invite two special adult guests to attend the tea party. Like last year, we will be going “back to the basics” to be sure that this is a child-centered event, and we welcome parents of early childhood students to volunteer to coordinate with the teachers to make this a memorable event for all. This is a new event this year, and we are very excited about it! Most likely, it will be designed for lower and upper elementary students. Liberty Science Center coordinates everything; we just handle promotion and signups on our end. Back by popular demand, the Poker Party will be held at the Middle School. Chips (Poker and potato), beverages, sandwiches, and cards are provided! We need a few dads to coordinate this event. This evening’s bingo games can be played by everyone! Moms, dads, kids, teachers… Held at the middle school, seasoned Bingo-caller Marilyn Stewart will be at the head of the Bingo hall (aka The Commons at the Middle School). Truly a fun family evening. Volunteers will coordinate a simple event at a snow tubing facility in the Poconos (likely Camelback). Families arrange their own transportation and meals, and we provide the opportunity to have some fun as a community. This year’s activity is yet to be determined, but past events have included an 80’s night at Game Vault and paint & wine evenings. A great night out for Mom! At the end of last school year, we thought that an early May family hangout would fit in nicely with the flow of things. We set aside May 3 of 2019 for some family fun. The committee can determine how they’d like to shape this event. Maybe a LEGO build night? A dance party? Board games? Some combination of activities? The important thing is that we will be together and having fun. Help to create a new ROS tradition! Help extend a warm Red Oaks welcome to new families joining the school. Sign up to be a buddy family, and we will pair you with an incoming family. Write them a note, give them a call, and plan to connect with them at school events. The fundraising model will differ from last year’s, in that there will not be specific PA fundraisers. We are grateful to those of you who have been such generous supporters in the past, and we know that there is still an interest to support the school through online book sales, Amazon Smile purchases, etc. The Board has approved this change so that the PA can support the significant fundraising efforts of the Annual Fund and the spring gala-type fundraiser. This fundraising initiatives are vital to the school’s operation, so we hope you will contribute. One of the most fun nights at the Middle School with DJ, dancing, costume competition, and lots of socializing! On a cool autumn night, students will play Paddle Tennis and enjoy hot chili at the Spring Brook Country Club. They will be given a group lesson followed by fun competitions and games. Students choose one or two movies to be watched in school on a cold winter night. Movie theater refreshments make for an authentic experience! Students play outdoor games, sing around the campfire, and enjoy making s'mores till it's dark. Celebrating the graduating class and saying goodbye to the school year! A new event this year! Students will play laser tag in the largest laser tag arena in the area at the Branchburg Sports Complex. Back by popular demand, we are giving you the opportunity to purchase the unique, durable, interactive, and engaging USBORNE BOOKS & MORE online to benefit Red Oaks. When you order from the site below, a percentage of the sale goes back to ROS in cash, and our classrooms earn free books! Feel free to share this link with anyone in the U.S. who has a bookworm in their life. There are options for infants through young adults. If you have any questions or need help ordering, email pa@redoaksschool.org. Please be sure that Susanna Short shows as the consultant and the eFair host so that Red Oaks benefits! It can get clunky to use this URL, but there is a solution! If you shop on your computer, we would suggest adding this URL to your "favorites," bookmarking the page, and/or creating a desktop shortcut. Go directly to this URL and shop as you normally would. Simply look for the AmazonSmile logo in the upper left to confirm that you are shopping on the correct site, and be sure that "The Red Oaks School Inc" appears under the search box as the charity that you are supporting. Click on the center icon along the bottom of the screen. It looks like a square with an arrow pointing up. Clicking on this icon will bring up a menu, including the options to AirDrop, Message, Mail, etc. Click on the "Add to Home Screen" icon that appears along the bottom row on the menu. Rename the App "AmazonSmile" or "Red Oaks Amazon" or whatever suits you, then click "Add" in the upper right part of the screen. Anyone can choose to support The Red Oaks School through their Amazon purchases, and we are grateful to all! You will see in the AmazonSmile description that our mission is "To lay the foundation for students to become engaged global citizens," and that surely holds universal appeal! Please forward this message to family members, friends, neighbors, coworkers, etc. If you run into any trouble creating an app or locating the page, shoot us an email (pa@redoaksschool.org), and we are happy to assist. The Rodriguez Ananin family joined the Red Oaks community in September of 2016. The family relocated to Madison, NJ, after seven years overseas. Olga Ananina and her husband Javier Rodriguez are parents of Alejandro and Nicolas. Alejandro is a fifth grader in the Middle School, and Nicolas is in the second grade. Olga is originally from Russia, Javier is from Colombia, and they are very happy to join the diverse community of Red Oaks. 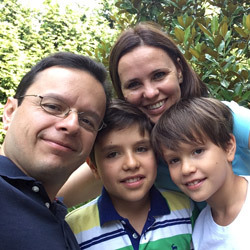 Olga and Javier are enthusiastic about their children's education and passionate about contributing to the school's amazing community. Joining the PA is a great way to get started. 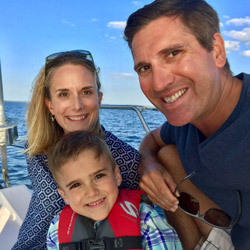 Susanna Short and her husband, Mike Short, are the parents of Grady, a kindergartener. Susanna and Mike work together in their family insurance agencies located in Denville and Long Valley. Susanna also has a background in teaching and as an educational strategist assisting high school students with the college admission process. Susanna was Montessori educated in the primary years, and her mother is a Montessori teacher in Philadelphia. She admits to initially volunteering for the PA for selfish reasons--to get a behind-the-scenes look at what her son does each day. In the process, she's met some wonderful parents and enjoyed working with the exceptional teachers and administrators. Susanna invites you to dip your big toe into the PA waters. You may just find yourself jumping right in like she did.